Ever since the game of baseball was invented, most athletes would agree that there’s no greater feeling than hitting a baseball perfectly. Even the most talented hitters in the game experience that perfect rhythm and timing intermittently. Those of us who love and play the game, have no doubt experienced the brief moments of sheer bliss of hitting a home run and hitting multiple hard hit games. During those hot streaks hitters commonly say, “The ball looks as big as a beach ball, it’s as if you slow the ball down”. Why is it so hard to hang onto that feel? Why do the hot streaks last only for a few days? We’ve all entertained the notion, if only we could have 20 or even 100 at-bats on the day when we’re the hottest? What type of success is possible for me? The T.A.P. Seminar and development weekend, is your chance to learn a proven system from someone who’s been there. TAP into your best timing and rhythm for hitting. But it’s not free…it’s going to take hard work, dedication and discipline but you’ll be training SMART and will make steady progress. Some hitters will catch onto the technique in moments, others in a day or so, but one thing is for sure, you have to give yourself the opportunity to learn how to hang onto those hot streaks…it can be done. You’ve been there before, you’ve felt that feeling, now it’s up to you to bring out what’s been natural inside you all along. The best hitters feel it more often because they’re able to access their automatic mind and free themselves from the distractions that would hold them back. Sure, in batting practice the best hitters launch the ball out of the ball park with ease, but it’s a whole different challenge to hit the ball in game situation…no one argues that fact. The mind is a powerful thing that allows the trained hitter to make the incalculable amount of adjustments needed to the hit the ball with perfect timing. Now it’s your turn to learn an organized system for developing your best timing and approach. Some say you can’t teach timing, but I say if you’ve felt it once then there’s a good chance you can develop your ability to access it more often…you’ve simply developed some bad habits in your approach along the way. There maybe skeptics, but those people haven’t been to this seminar and training course. If you are an aspiring young high school or college player with the dream of playing professional baseball, you can’t miss one of these seminars and a chance you get some personal advice about your individual approach. You’ll get a hands on evaluation of what you’re actually doing that’s holding you back and you’ll also learn the things you’re already doing well. We will show you how you’re reacting to the pitchers delivery NOW and you’ll get a glimpse into your possible future. 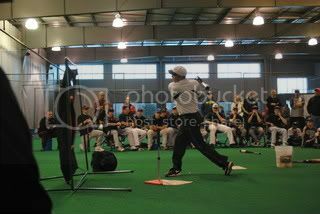 You will receive personal tips on how you can modify your training to bring those hot hitting feelings to the surface, accessing them when you call on them. The best players are obviously able to tap into that perfect place with more regularity, but even the best hitters admit that it comes and goes. As a Major League Player, I’ll admit I had those seasons that it seemed like I made a million adjustments in my swing, but timing for me came more natural than it did for most. Throughout my career, I was determined to find a way to access that part of my automatic mind that would bring out my best timing and I’ve been developing the system for over 25 years. As I started to teach this method, I continued to play in professional baseball as a player coach/manager with even greater success, all the while I was refining the process and learning how to best explain it. It’s so simple but you have to earn it and learn the movements. This is your chance to learn an organized plan for developing your mind so you can TIME any pitcher, at any speed, any time, with more consistency and better rhythm. What if I told you that I could teach you how to TAP into your perfect timing abilities on a more regular basis? There is a reason why you see the ball better on those special days…you’re accessing the correct part of your mind to synchronize the pitchers delivery…and I want to show you a way to develop your natural ability. I had a long and exciting journey playing in Major League Baseball and I can confidently say, I’ve experienced all the ups and downs that you’re experiencing probably by a factor of 100. People used to ask me how fun it was playing in the Major Leagues and I’d usually come back with…Fun? I wouldn’t call it fun necessarily, co-ed softball is fun, in baseball there’s too much fight and grind, there’s too many struggles and incredible triumphs to call it fun. A standing ovation in Yankee Stadium for instance, after hitting a big home run isn’t fun so much as it’s hero stuff. Success is allusive even for the best hitters in the game and cannot be taken for granted but if you have the opportunity to learn from someone who’s been taught himself by the best in the game, then you cannot miss out. Your alternative is to continually change your approach on every at-bat and using your mechanical changes to make timing changes. Think about that…you’ve been making timing changes with mechanical adjustments…does that seem right? It’s a vicious cycle and we’ve all been there. You’re trying to hit a round ball with a round bat, being thrown by someone trying to make it impossible for you to hit it. In every area of our lives, we learn the lessons from discipline and training and we’re continually discovering how we can accomplish amazing feats of athleticism when we’re fortunate enough to access our automatic mind successfully…it’s time to move on and learn a professional approach to the whole thing.